Welcome to Waveguide Networks, your Full Service Source for Fiber Optics and Wireless Network Solutions. We have the absolute lowest prices on quality fiber cable. Clients have realized savings of at least 8% off any other cable manufacture price. Call and compare pricing on your network needs. 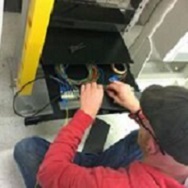 We are pleased to offer complete turnkey projects including OSP/ISP fiber optic cable, patch panels, and splicing services to deliver a complete fiber optic network solution.